It's the time of year where my company forces me to go through the agonizing process known as "performance review." They insist that I document my work-related accomplishments in a tool called "Talent Maker," which reminds me a bit of the old DOS CLI in terms of usability. While I think I do a perfectly acceptable job in my professional endeavors, I'm at a point in my life where I really resent the need to document every little thing I do in order to justify my continued employment. I'm a good engineer. I keep apprised of new technology in my field, I'm responsive to my customers, and I work hard to be a good team-mate. People who know me in a professional context know these things about me, and yet every Fall I spend hours justifying my life. Ah, corporate America. I love you for paying my mortgage. I hate you for allowing your bureaucracy to turn me into a cynical old grump. On Saturday the Smart Man and I went out to Coors Field to watch the Colorado Rockies take on the Cincinnati Reds with my fabulous Aunt and Uncle. The Rockies won (for a change), which was disappointing to the Smart Man who is a Reds fan from way back. I was very sympathetic, though. Okay, not really. I believe I gave him the Nelson Muntz laugh, in fact. 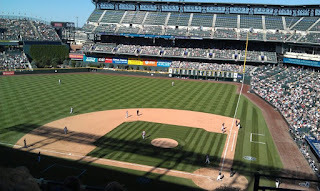 However, the weather was just perfect for a game, sunny but not too hot, and Coors Field is an awesome venue. So we have a crappy team and an awesome venue. One out of two isn't bad, especially in baseball. I'll be leaving tomorrow for Austin, Texas, followed by Kansas City (again), returning on Thursday evening. I had a request to fly to Pennsylvania immediately following KC for a meeting on Friday, but declined - the logistics of such a trip made my hair stand on end. Now that the Smart Twins are self-sufficient and off the payroll, I don't mind traveling periodically, but I do try to keep the travel-related stress below the "stroking out" level. Plus, the Smart Man and I will be leaving for the Breckenridge Oktoberfest on Friday, and I'm not really interested in cancelling another personal trip due to work-related travel. Because, you know - beer. Then I'll be heading out to San Diego the following weekend to spend time with The Mechanicky Gal and the inestimable Jeri. I'm not sure how I managed to get so over-scheduled for September. Usually I don't allow that to happen, but since most of my activities are friend/family/fun related rather than telecom related, I'm going to take the whole thing as a "win." And then possibly hole up for the entire month of October. Any chance you will layover somewhere else in CA on your way to San Diego? Maybe a certain library that got a new donation sort of in your name? filelalaine, I fly non-stop when I go to San Diego, so I'm afraid not. But the next time I find myself in LA, you'll be on my list. Glad your balance is coming out on the side of "more time with friends and family" while that is still tiring for an introvert, it's usually a good kind of tired. "So we have a crappy team and an awesome venue." As a Cubs fan, i feel your pain. And then possibly hole up for the entire month of October. It's my birthday in October. Come here and help me celebrate with beer and chocolate and absolute laziness. Well, when you’re in KC again, and want an artery clogger, go to Stroud’s for some comfort food. Oh ya BEER! I'm so jealous; Breckenridge for Oktoberfest, the high country is OMG beautiful this time of year, good camping weather up there. PS. "And then possibly hole up for the entire month of October." Ooooo, I'm all for a road trip to LA! I heartily endorse the "roadtrip to L.A." proposal. Roaaaad trip! Roaaaad trip! Roaaaad trip!!! You people are going to be the death of me. Did you not get the whole "hole up through October" part? Maybe after the first of the year, or after baseball season starts. Then we can go see the Dodgers! Ooh, if y'all come here after baseball season starts, maybe we can time it for when they play the Rockies!